Stainless steel sinks add a modern, professional touch to any kitchen. Unlike enameled cast iron or porcelain sinks, stainless steel is susceptible to scratch marks from contact with utensils and cookware. 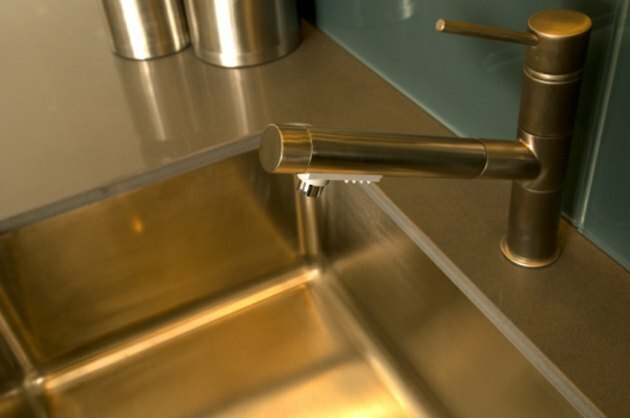 While stainless steel sinks resist rust, corrosion and stains, they require special care and cleaning methods to maintain their shiny metallic finish. Clean your stainless steel sink with a mild abrasive to remove small scratches, and protect it with a light coat of oil. Clean and dry your stainless steel sink after each use. Sprinkle an even layer of stainless steel cleaner on the sink according to the package instructions. Rub the stainless steel sink with a wet sponge in small, circular motions to remove any scratch marks. Rinse the stainless steel sink thoroughly with water, and dry it with a towel. Apply 1 to 2 tsp. mineral oil to a soft cloth. Wipe a thin layer of oil over the stainless steel sink. Remove any excess with a clean portion of the cloth.